My 30-day outdoor overhaul is complete. I came in just under the wire, with the goal of finishing by April 30th. It’s been a full month with one three-day weekend spent in Reno chaperoning my son’s Key Club event and another partial weekend away touring colleges. Throw in an unexpected root canal and it’s been quite the month. Phew! Serena of Thrift Diving hosts 30-day challenges a few times a year. Several of us sign up for the extra motivation that comes with a deadline. Since I live in California, I’ve been lucky with the weather. We had a bit of rain on one of my painting days, and some windy days too, but nothing like the rest of the group. Serena actually extended the deadline by one week, since so many of the participants have had late-season snow. I’ll be sure to share Serena’s post with all the challengers when they finish. Without further ado, here’s what I accomplished this month. 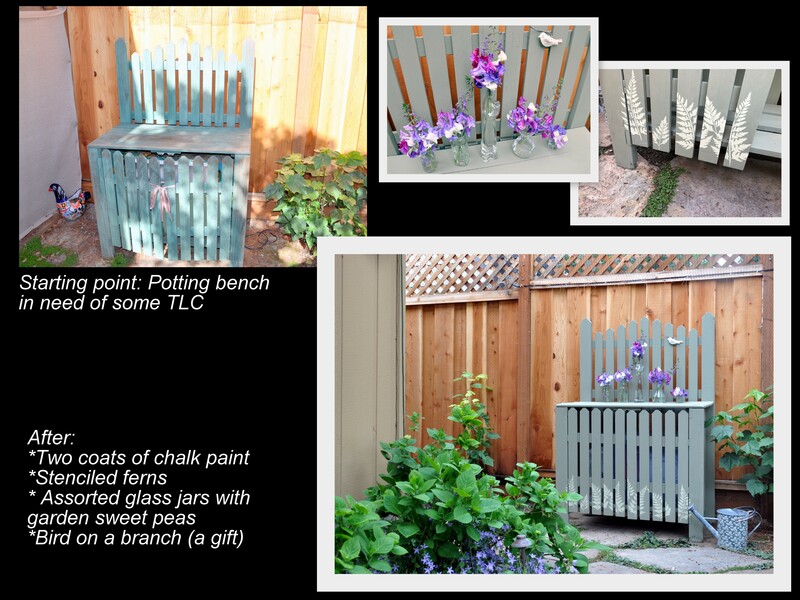 I’ve talked about repainting my potting bench for years but never quite got around to it. Now it’s done and I’m so happy. 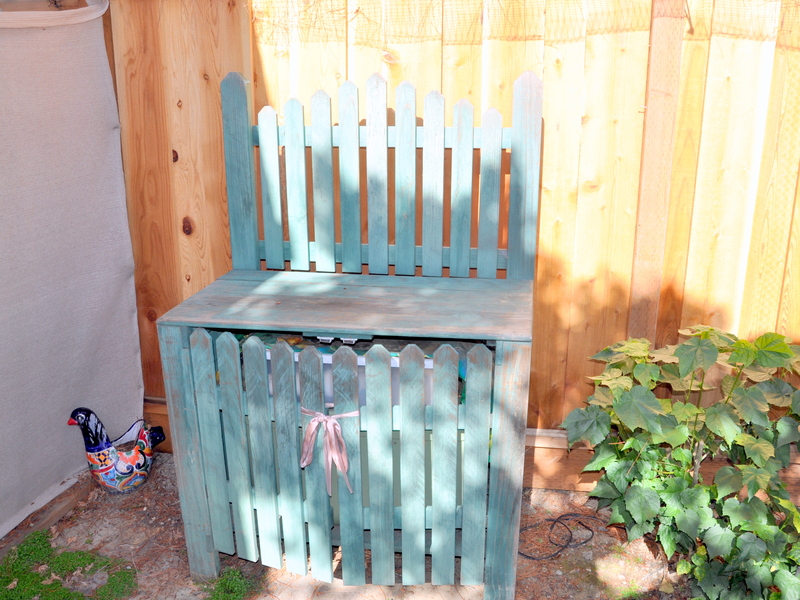 I painted the bench inside and out with two coats of Annie Sloan’s chalk paint. 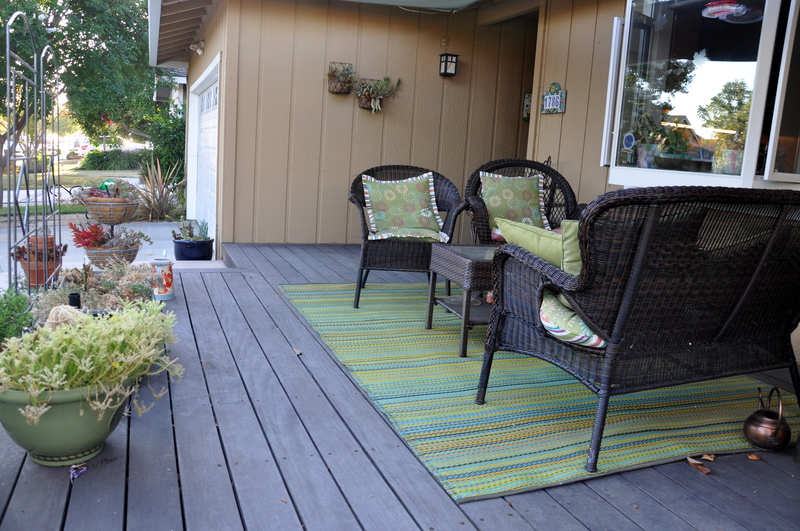 Once dry, I stenciled ferns along the bottom slats in a lighter shade of chalk paint. I arranged a variety of glass jars with fresh sweet peas along the top of the bench. I like the look of green and purple together. My friend Sherri gave me the decorative bird you see at the top of the bench. It’s perched on a pine tree twig. About six months ago, I installed a make-shift temporary “gate” pictured above to keep Tessa from wandering out of the yard. 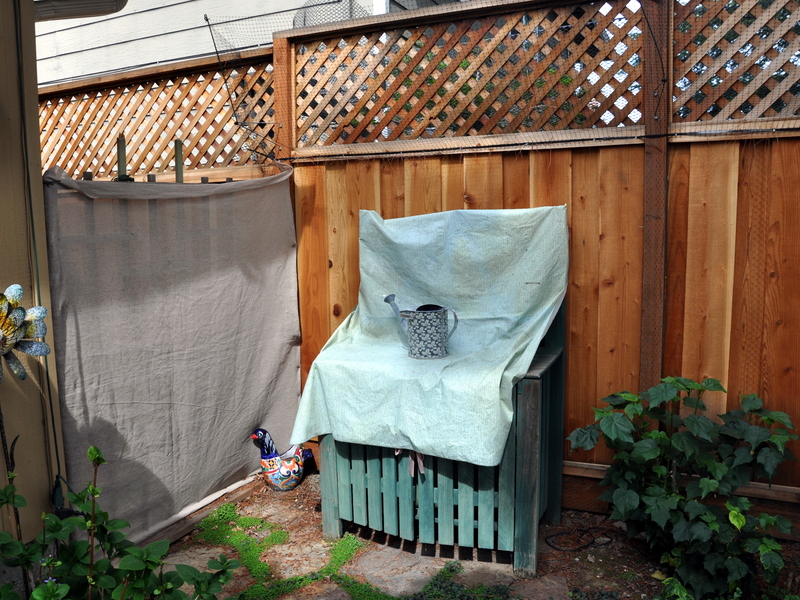 I used an old wooden trellis, a 2 x 4 and a scrap of shade cloth, all items I had on hand. On the plus side, it served its purpose (keeping Tessa in the yard). On the down side it was ugly and impractical. Once I started calling for quotes, however, the options for a metal gate seemed bleak. They’re all custom-made and cost thousands of dollars! Instead I worked out an alternate plan for free. 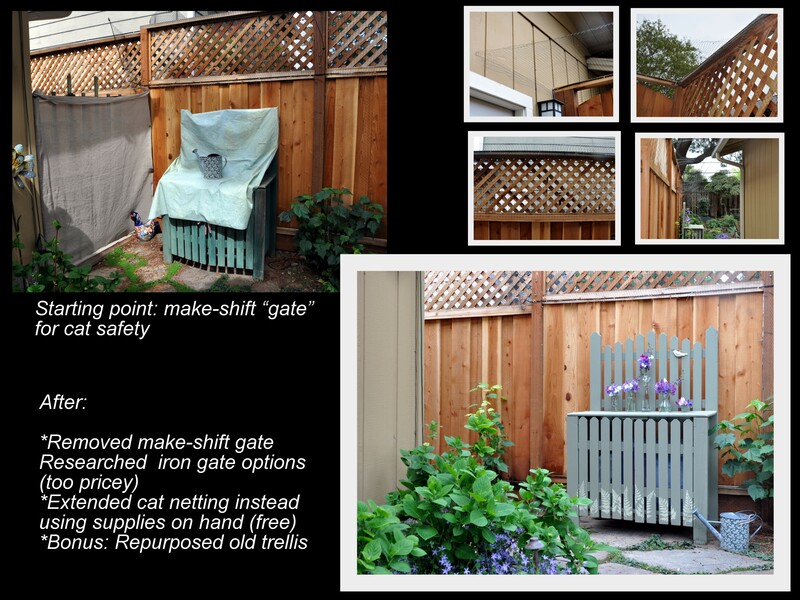 We extended our cat-fence netting all the way to the wooden front gate facing the street. We had just enough leftover from the back fence to finish the job. We used a remnant to cover the gate leading to the street. I’m so happy to have access to the side-yard once again and I’m pleased with the way it looks. Here is a bit of serendipity. I reused the old trellis to complete goal 4. Though the bottom of the wooden trellis is partially decayed, I simply attached a pair of garden stakes with zip ties to support it and to keep the trellis off of the soil. Mike helped me pound the stakes into the ground to support the free-standing trellis. This goal is neither exciting nor blog worthy, but a goal is a goal. 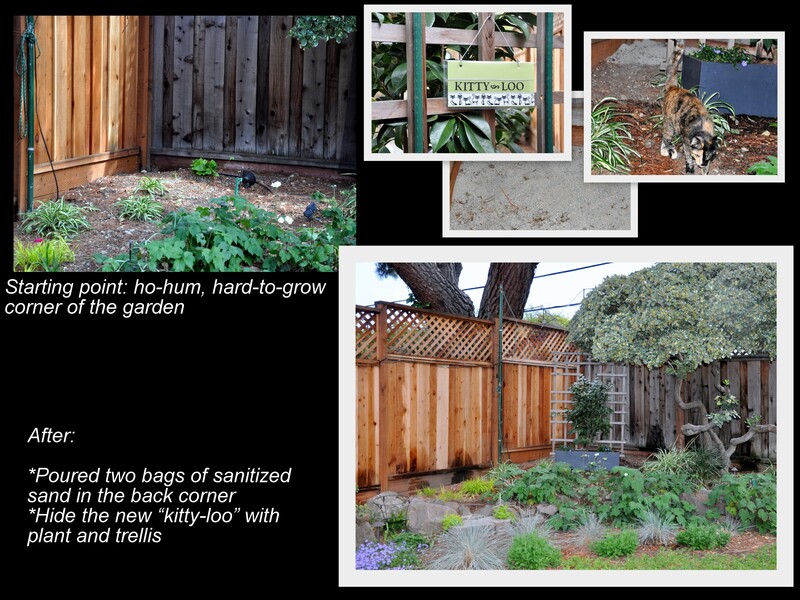 I picked up two bags of sanitized sand at a hardware store and poured it into the back corner of the garden. Tessa and Mouse explored and then started using the sandbox. I’m hoping this cuts down on the deposits in other areas of the garden. 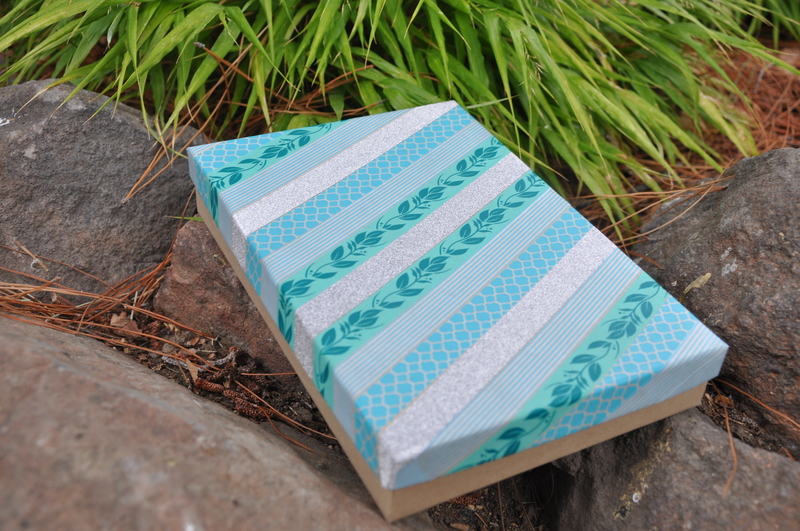 I made the Kitty-Loo sign out of scrap paper and Washi tape, then slipped it into the bottom of a page-protector. The silver cord came from my stash. I wanted something to photograph for this post besides a pile of sand. 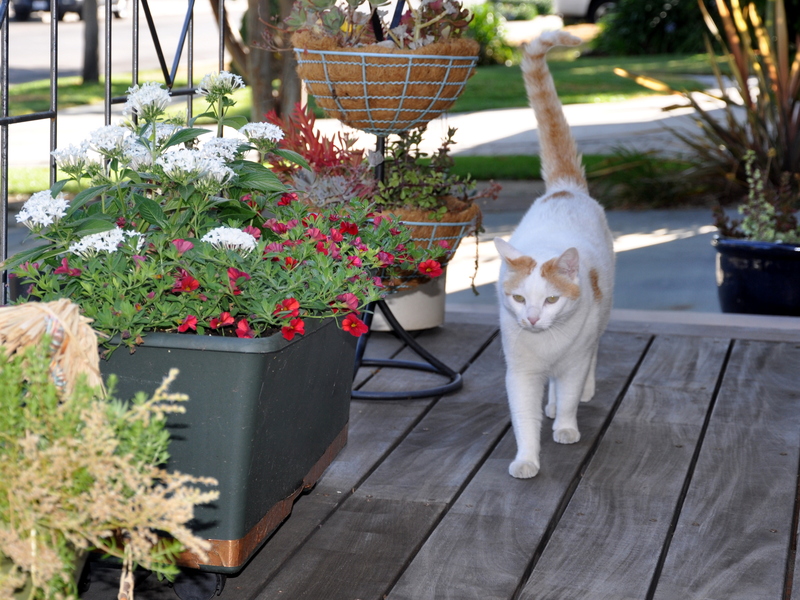 Goal 3 blends nicely with goal 4: camouflaging the kitty box and beautifying the back corner. I bought a 10 x 40 inch planting box, and set it on an angle in the corner near the back fence. Instead of a vine (my original plan) I bought a gorgeous white camellia. 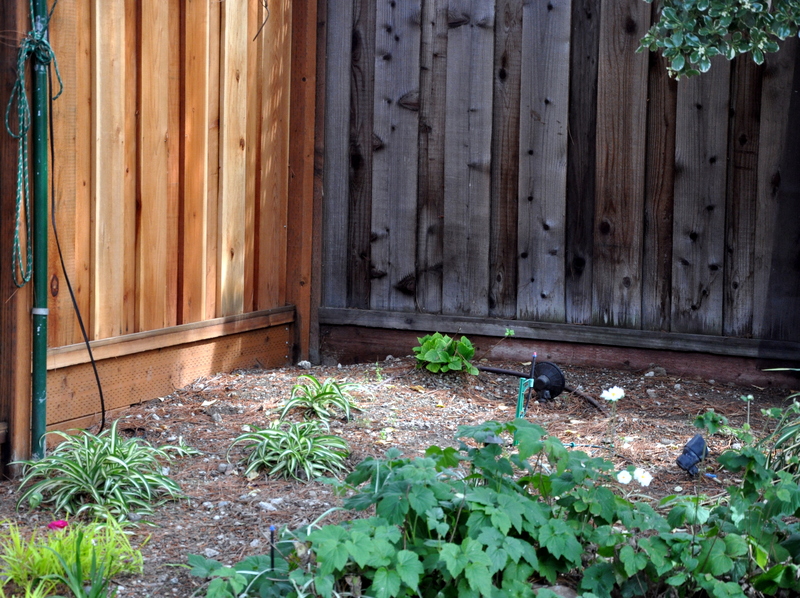 I planted purple periwinkle (vinca minor) on either side. The camellia will grow wider over time, eventually hiding the trellis all together. This corner looks so much better than it did. 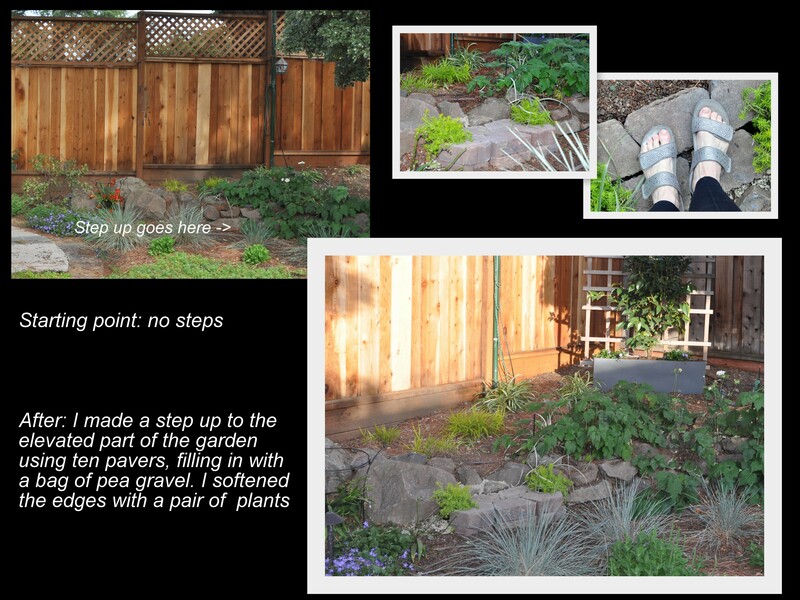 I used 10 inch pavers to create a small step-up to the elevated planting bed along our back fence. I only needed ten stones, and a bag of pea gravel to pull it together. 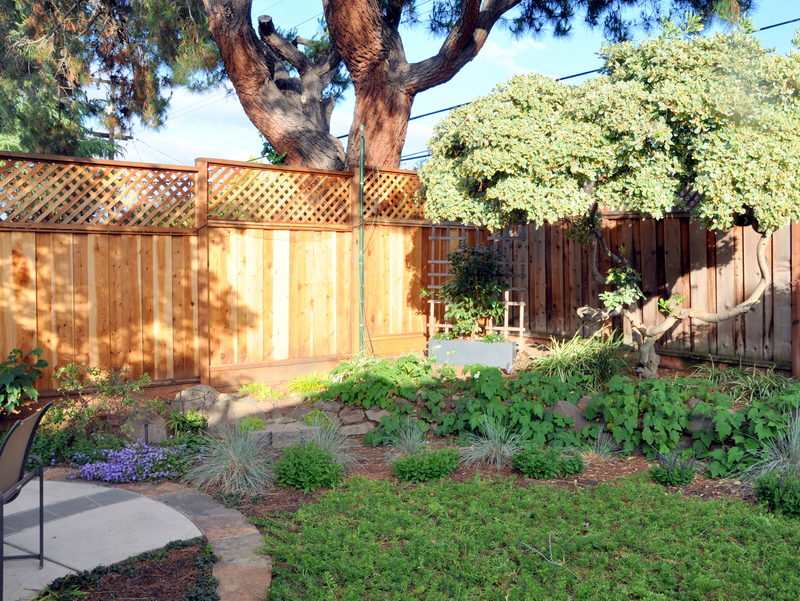 Although the rock wall is natural and the pavers manufactured, I was able to soften the edges with a couple of plants. The first time I used the steps I felt like a kid in a candy shop. They work really well. There are a number of challengers working hard to finish their outdoor projects. When Serena posts her blog with all the finishers, I’ll be sure to share it here with you. If you think you might like to sign up for a future Thrift-Diving challenge, you can subscribe to Serena’s blog or follow her on Facebook at Thrift Diving. 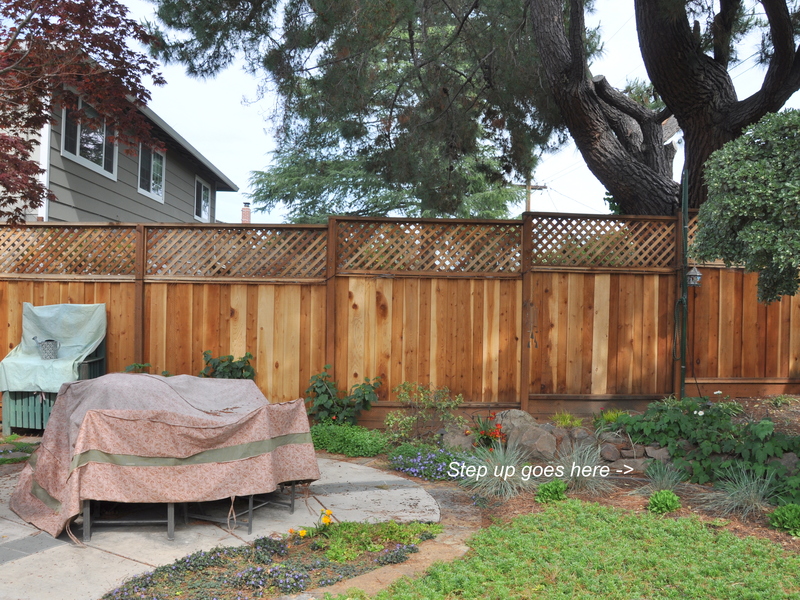 Two years ago I signed up for Serena’s Thrift Diving challenge: a 30-day outdoor patio makeover. She’s hosting another one this month, also outdoors. It’s amazing how these challenges can light a fire under your feet. Serena hosts these challenges a few times a year. 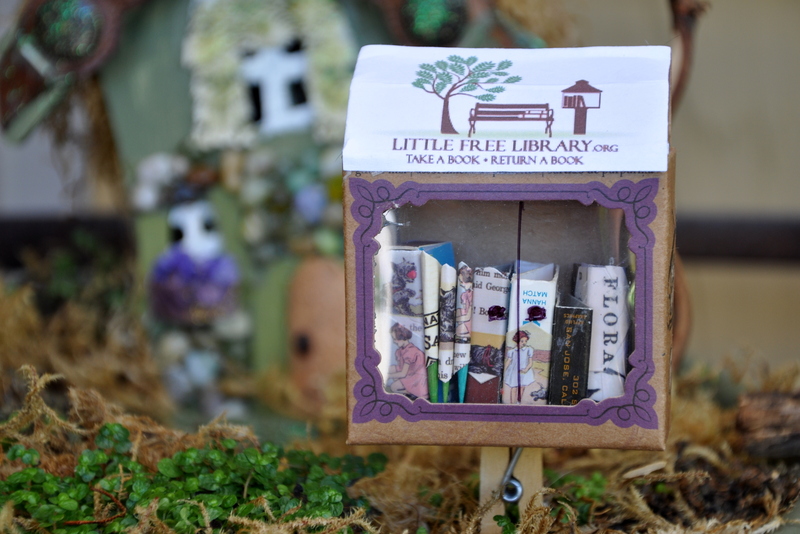 You can read about her April challenge here. Several of us sign up for the extra motivation that comes with a deadline. 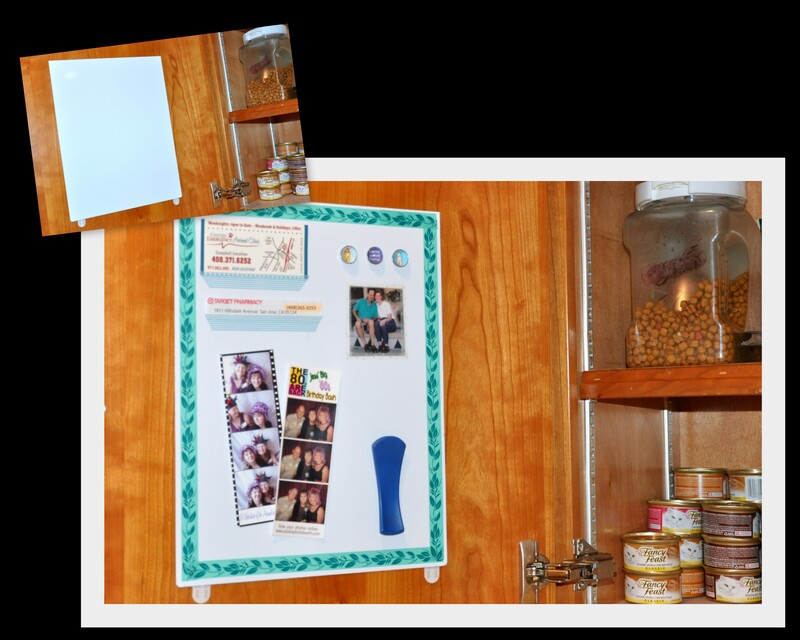 She even has a closed Facebook group where we can post pictures, ask questions and share in other do-it-yourself projects. It’s a lot of fun. Today, however, I’m feeling the pressure of the challenge. We have college tours coming up this month and a weekend away chaperoning a school activity, so I need to keep moving. Writing this post will help me collect my thoughts. 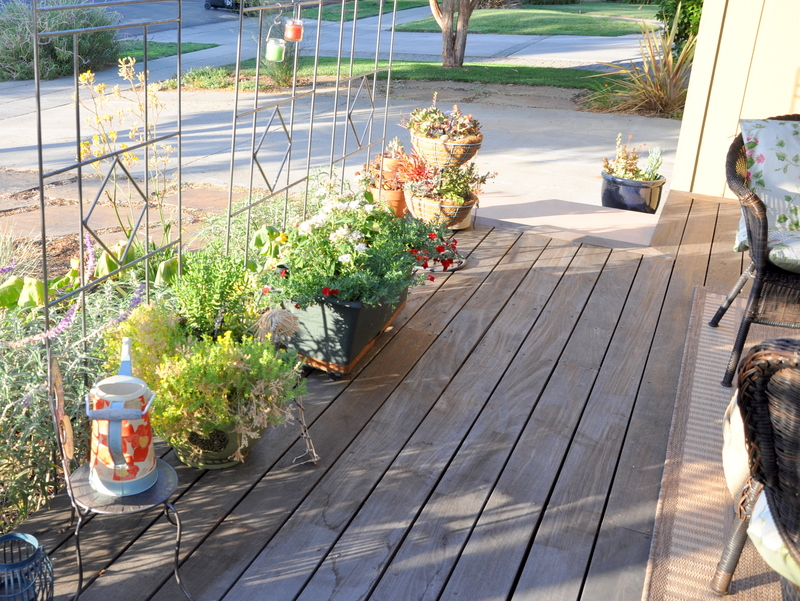 I have a good start thanks to Serena’s Outdoor Overhaul Makeover Journal. Repair wasn’t part of the deal, but this morning I moved the bench on my own to the patio for cleaning and broke one of the planks. The bench is 15 years old and stays outside year round so it’s not that surprising. It looks like they used staples instead of screws to attach the top planks. I’ll need to sort that out. 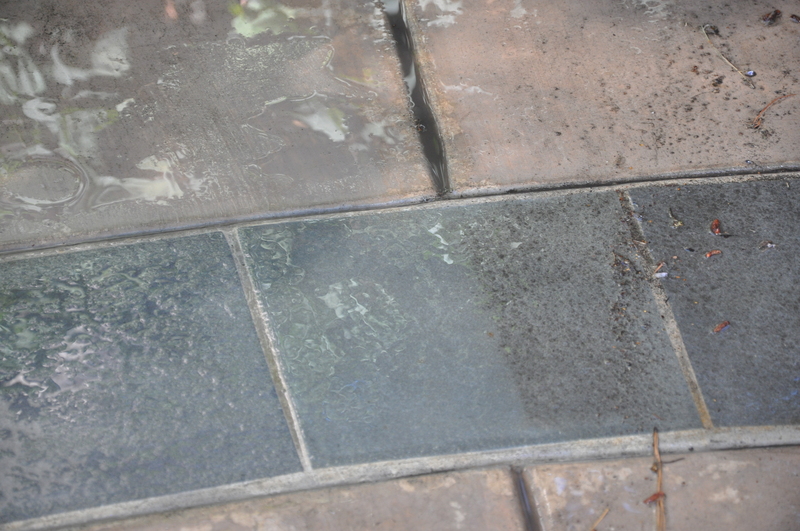 The broken plank exposed a few startled silver fish. After they vacated the premises I employed my multi-step cleaning process. I used my small leaf blower to chase away the large debris. I used a small brush to clean the crevices, then a larger brush and finally gave it a strong blast with the hose before one last scrubbing. We have two more sunny days before a set of storms pass through, so I’m taking advantage of the weather. This is a long story, but I’ll try to make it quick. 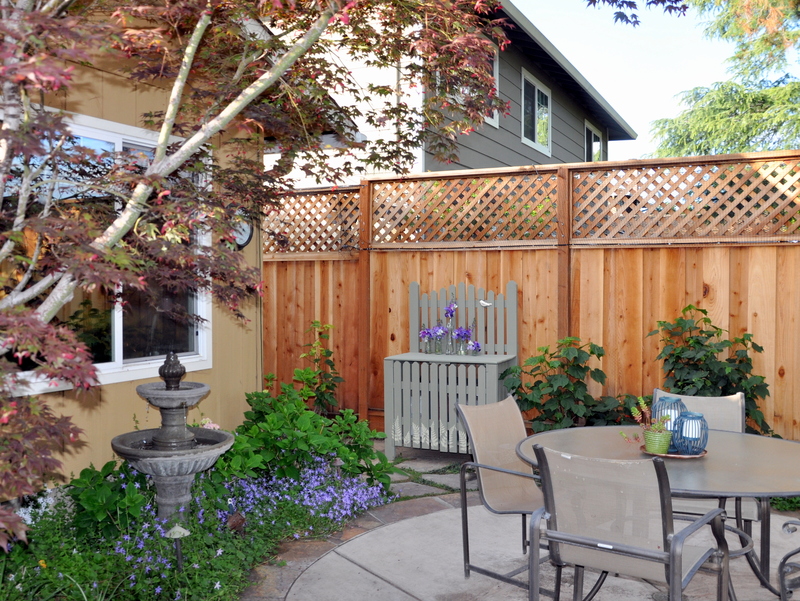 We had to replace the damaged fence along our side yard over a year ago. 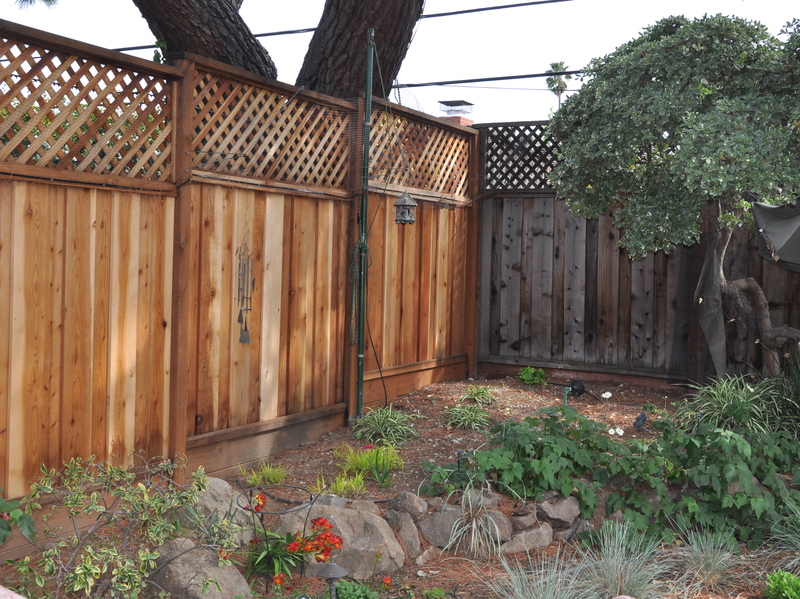 It took nine months from the start of the quotes to a finished fence for a variety of reasons. 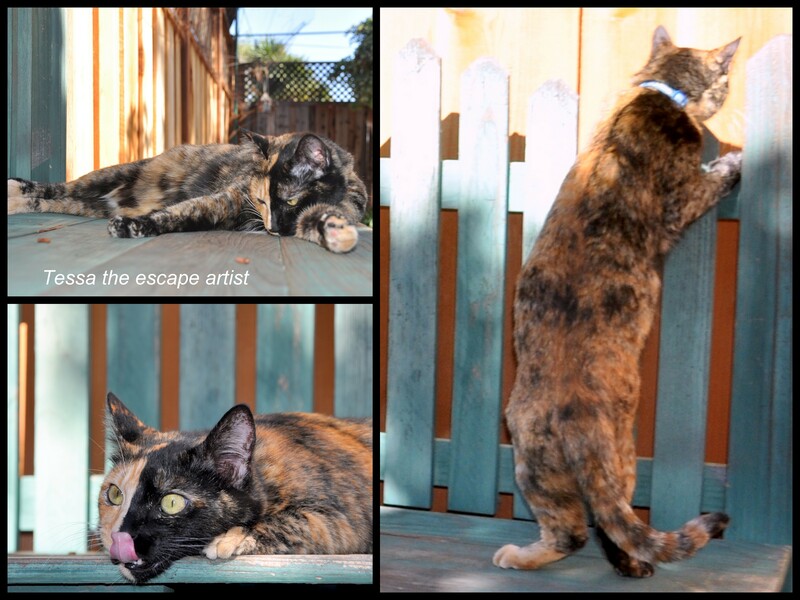 We had cat-netting along the old fence to keep the kitties safe in the yard. I wanted to add a second gate so we could reduce the amount of netting which gets tangled in the vines, but one that you could see through. The fence company couldn’t do it. It’s now been six months and I still haven’t sorted out a quote or a DIY solution to keep our climbing kitten safe in the yard. Yes, you read that correctly. When you have small children you keep your sandbox covered to avoid unwanted deposits from the cats. My boys are young adults and the sandbox is history, but our kitten, Tessa, prefers using the garden mulch to take care of business. I’m hoping to add a sandy area along the back fence to encourage her to use that instead. Cats like sand, so it should do the trick. The back corner of the garden has always been challenging. A large, neighboring pine tree shades the area, drops pine needles and sends up roots. It’s almost impossible to dig in that area, and when we have managed to wrangle the roots out-of-the-way to plant other things, they struggle to thrive. 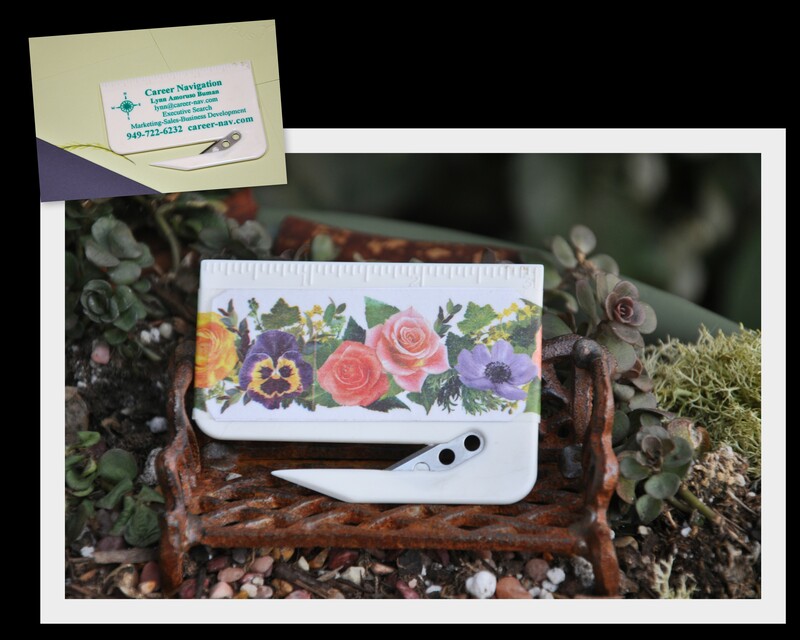 I’m going to look for a planting box that sits on the soil at an angle. 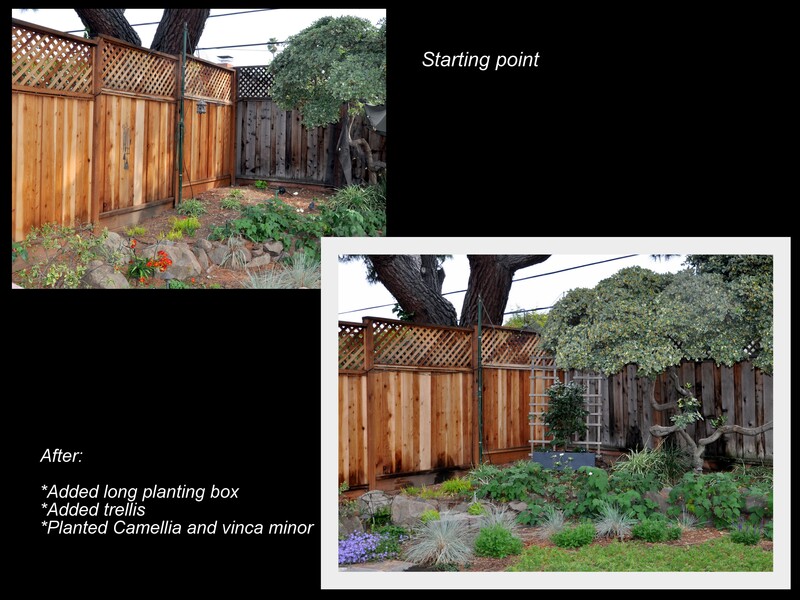 I’ll plant a shade-loving vine, then add a trellis behind the box. 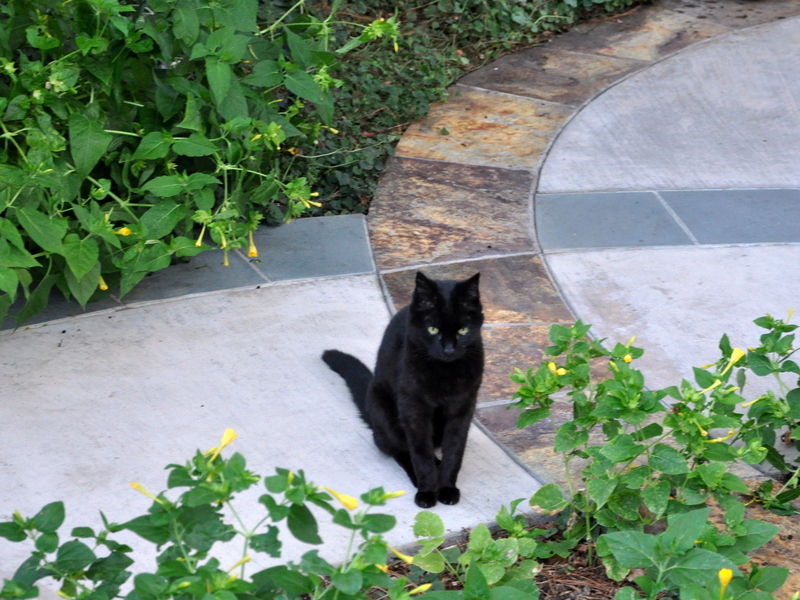 This will beautify the area, and at the same time camouflage Tessa’s outdoor facilities. Win-win! Ah, age! It doesn’t look like much of a rise, but I’m finding it increasingly difficult to get up and down from the raised planting area along the back fence. It hurts my back, or my knees or my feet. 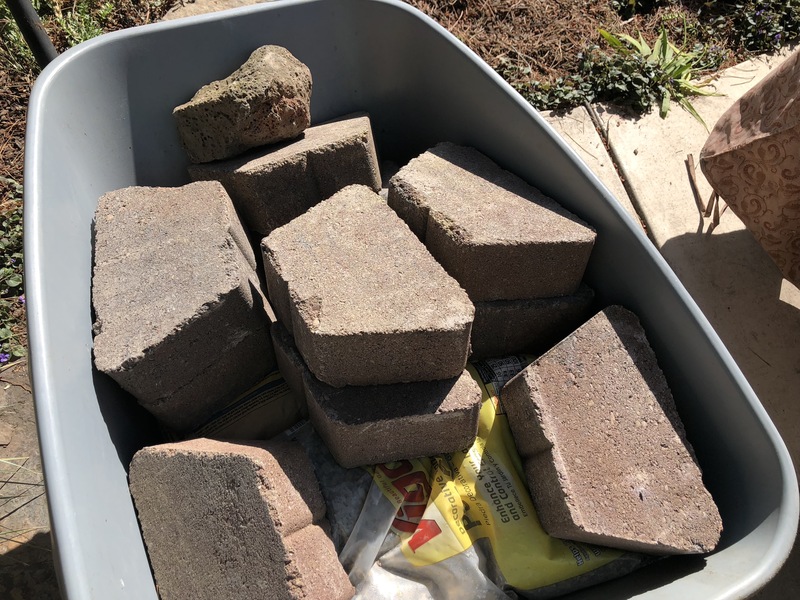 I don’t know why I didn’t think of this sooner, but I’m going to buy a few pavers to create one or two steps to make it more accessible. After these last storms I can remove the cover from the table and chairs. Tessa loves spending time in the garden. It will be nice to have her company as I work through this 30-day challenge. Thank you Serena for inspiring us. 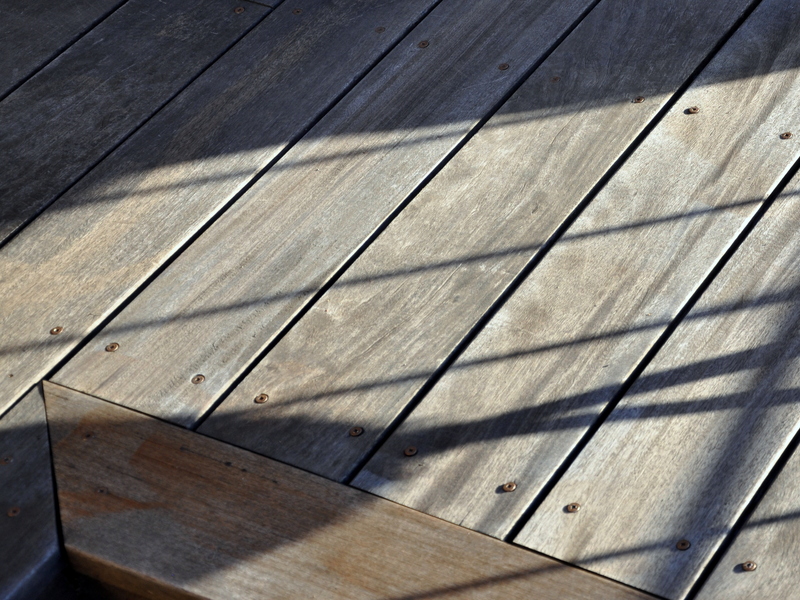 Do you have a room, patio or deck in need of some TLC? 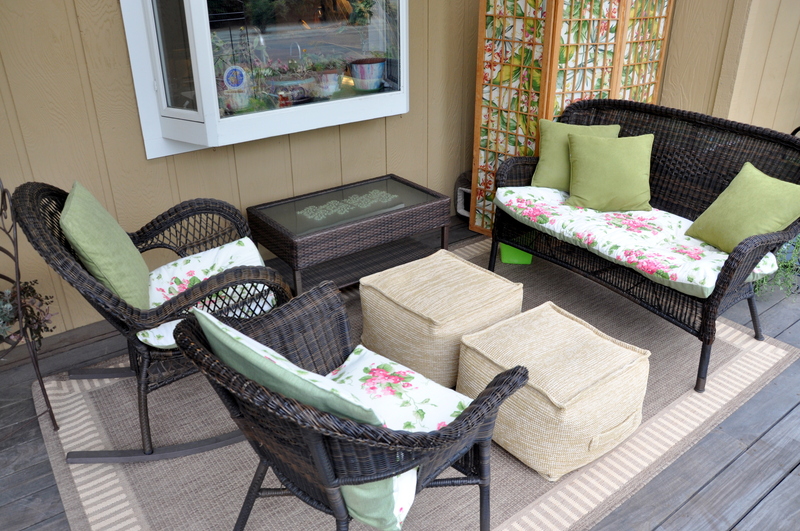 In late June I signed up for Serena’s Thrift Diving challenge: a 30-day outdoor patio makeover. Serena hosts these challenges a few times a year. Many of her followers sign up for the fun of it and for the extra motivation that comes with a deadline. I’m an avid follower of her down-to-earth, informative and fun blog. 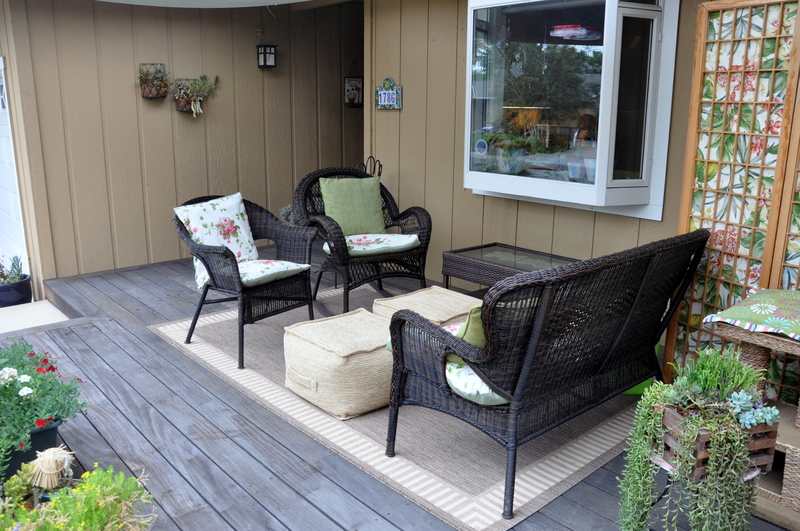 Our deck needed refreshing more than a complete makeover, but I signed up for the July challenge anyway. I forgot, momentarily, that I would be in Canada for nearly a third of the month, so I quickly realized that I better get to it. It was the impetus I needed. I pulled together most of the details before boarding a plane July 18th. I found Thrift Diving through Leilani of Keeping Up with Mrs. Smith. 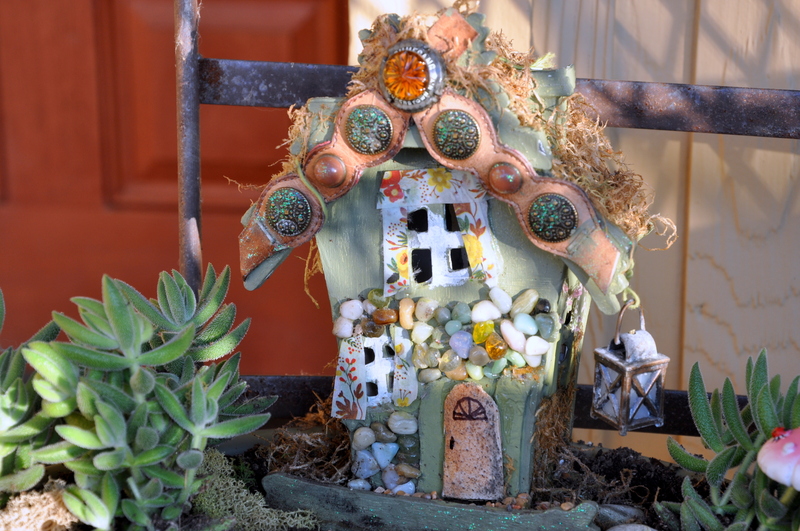 Serena and Leilani are DIY goddesses. I admire their skills with power tools and their can-do attitude. Believe it or not, this step was the most intimidating. I don’t own a pressure washer, and I’d never tried using one. It’s a powerful tool requiring precautions. I borrowed a pressure washer from my friend Jasmin, then watched a couple of videos on how to use it before getting started. Comically, the hose detached at least twice, showering me with a startling blast of water before I finally got the hang of it. My son helped me move everything off the deck, and then I got to work. It worked so well, that I used it on the back patio, in the garage and along the driveway. I even pressure washed the table and chairs out back. They’ve never looked so good. A few years ago, I bought a light-weight area rug to go under the furniture. 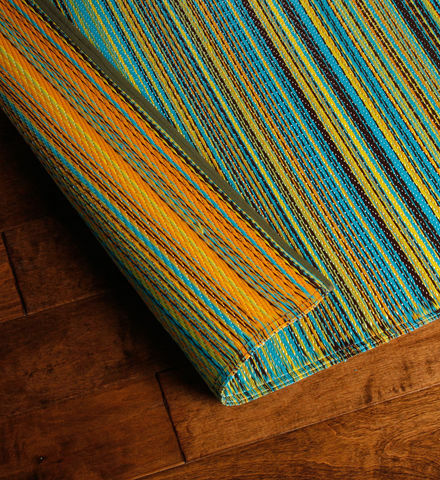 On the plus side, they crafted the rug from recycled materials and it was incredibly light in weight. On the down side, and believe me this is a big one for me, I kept tripping over the edge. The lighter weight proved to be a major disadvantage. Even with furniture weighing it down, the edges would still lift up. My balance is not what it used to be. It had to go. 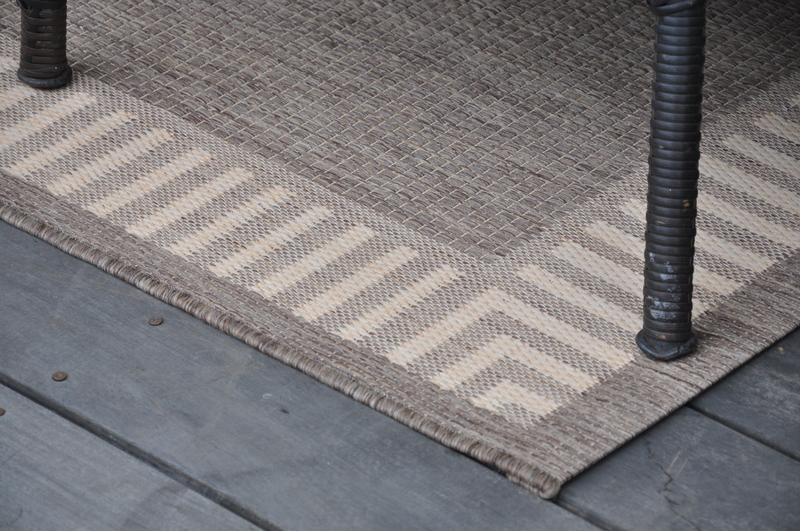 I shopped on-line for the perfect size, weight and color and found one in a neutral tone that is warmer, softer and a bit more substantial under foot. It arrived while I was away. It’s not always easy buying something like this on-line, but I’m pleased with the quality and design. The 15% off coupon was nice, too. This is where the pressure of the 30-day challenge really came into play. 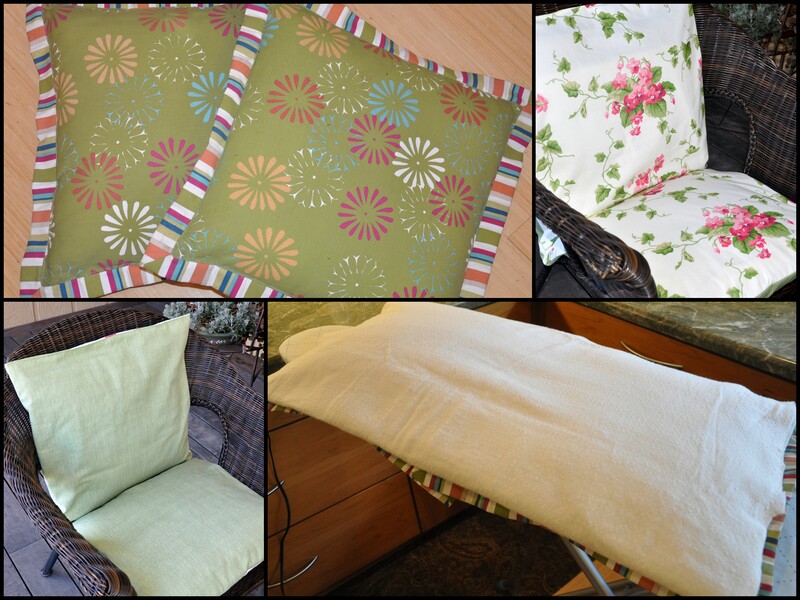 I bought the fabric for new covers several months ago, then got busy with family, work and travel. The fabric sat there taunting me. I envisioned summer and fall passing me by, with that beautiful fabric remaining folded and unused. Once I came to terms with the fact that I had to make the covers in stages, it was easier to get moving. I set up the ironing board and ironed the fabric. Done for the day. 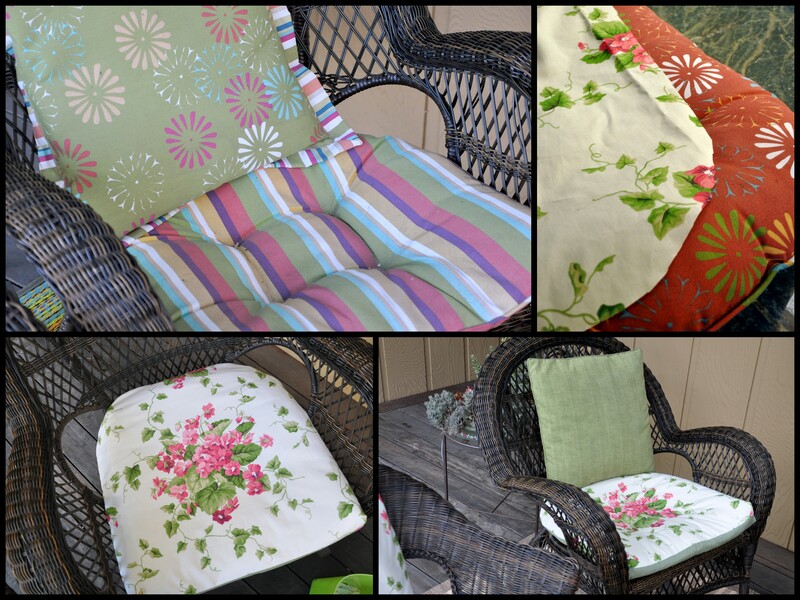 Then I dusted off the patio cushions and brought them inside. Done for the day. Lindy is probably wondering why I don’t just leave this cushion in the open doorway. I worked in stages to get things done, and low and behold, I had three new slip covers. 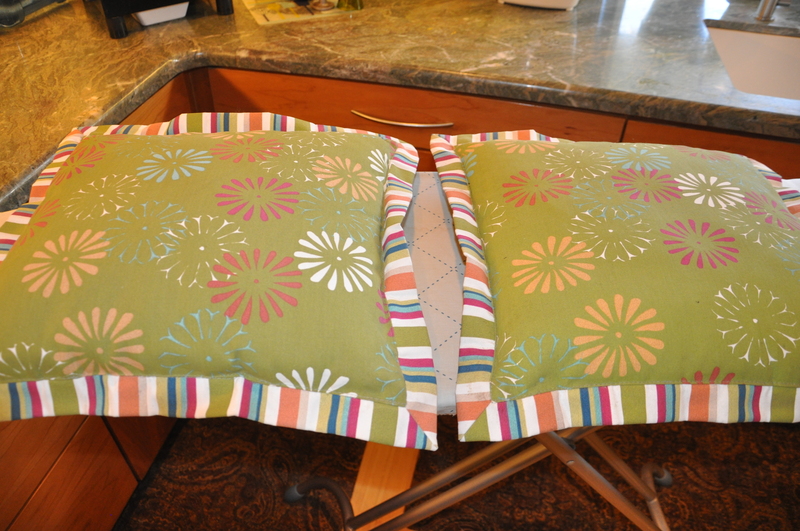 Recovering the seat cushion for the rocking chair. 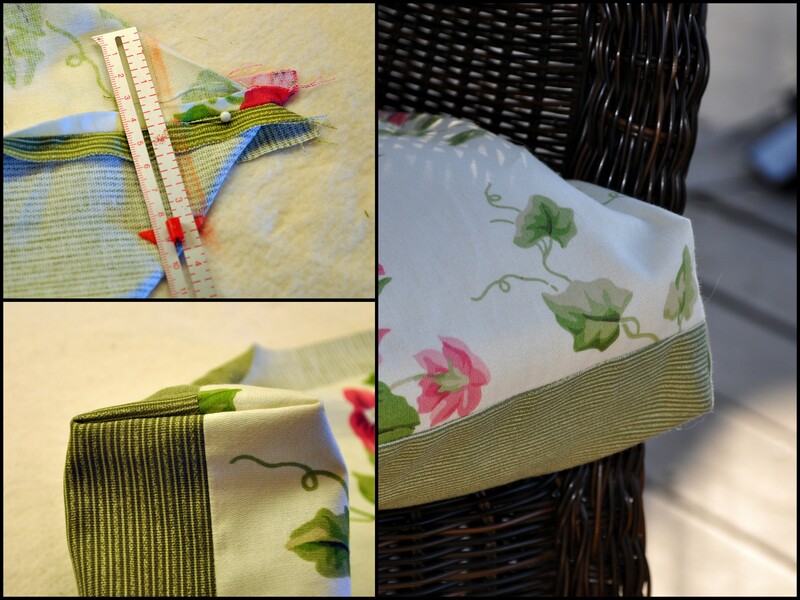 Extra padding, squared off corners in front, and curved seams in back. 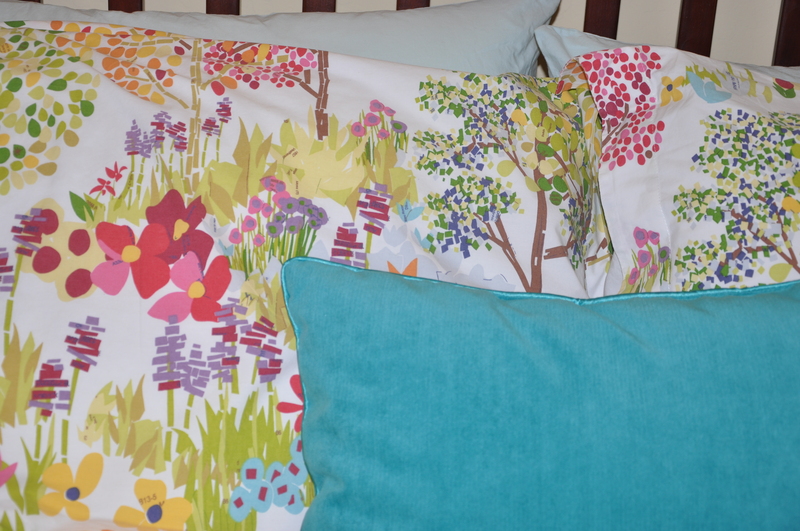 The floral print fabric was a bit more pricey, so I bought just enough for one side of the covers. I bought a less expensive, coordinating green stripe for the reverse side. I also bought extra padding to make the cushions more comfortable. (Please don’t mention this to the squirrels). I’ve never made box corners before, but I like the way they look. I looked at a few sites, and found not only simple directions, but a blog with a sample of the same striped green fabric. What are the odds? Serena uses stencils in a number of her projects. She’s a pro. I needed to start small, so using leftover craft paint and a $3 stencil, I added a pattern to the underside of our small patio table. 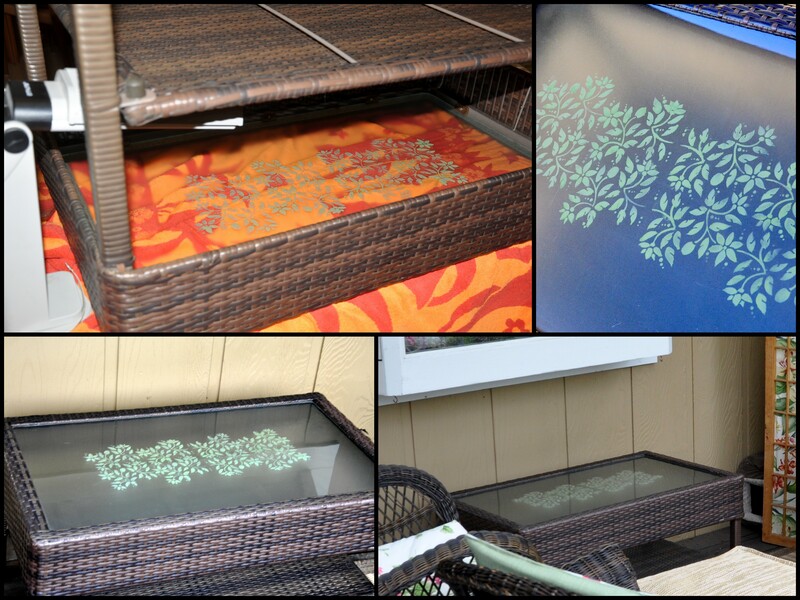 Stenciled Table: I turned the table upside down on a towel, then used my craft light so I could see in the small space. I repeated the stencil pattern twice using craft paint on the underside of the table. It was easy and fun, not to mention removable, if I didn’t like the results. Since I painted the underside of the table, I don’t need to worry about damaging it with use. We only use our BBQ once or twice a year, so the rest of the time it’s pushed to the corner of the deck. Even with a cover, it looks like an unwanted appliance shoved into a corner. I wanted to find a solution to mask the appearance but at the same time make it easy to get to. 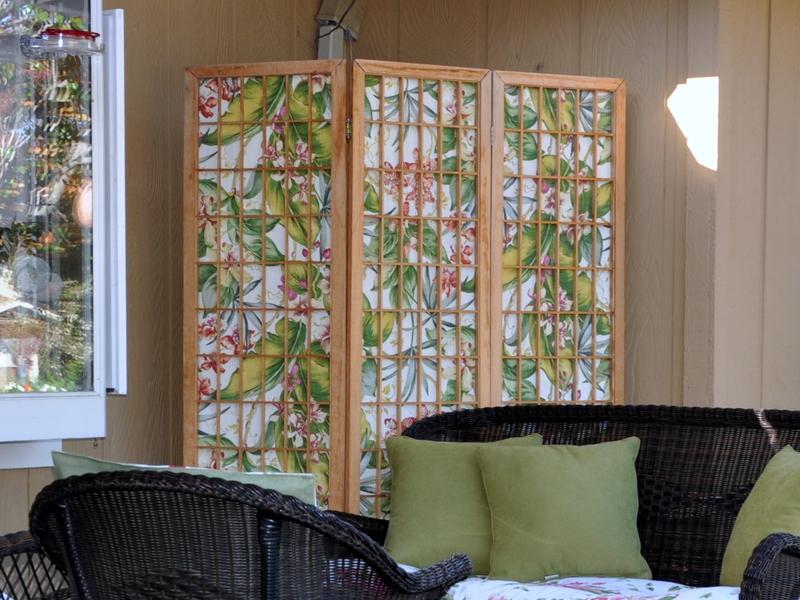 I “borrowed” this folding screen from our garage to see if it would do the job. I like it! I plan to keep it on the deck. Like many things around here, this screen has had multiple uses over time. It once hid my young son’s “technology corner”, a spot in our living room where he liked to sit with his friends and his plush animals playing with his hand-held DS. Year’s later I removed the damaged paper from the screen and re-covered it with leftover fabric from my first swing cover. We used the screen in the garage for many years to mask the water heater and furnace and to discourage small hands from reaching into dangerous places. I’ve now pressed it into use on the deck. 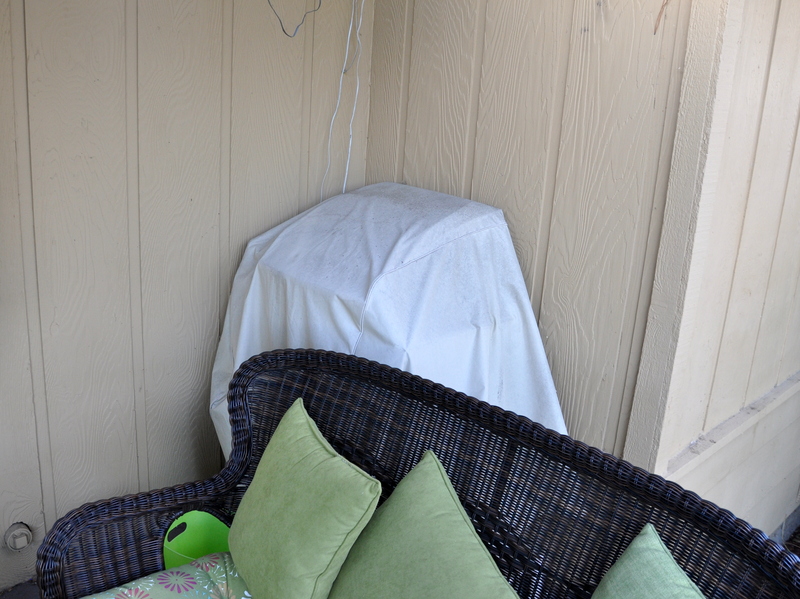 There is a small cat bed behind the screen as well as the BBQ. 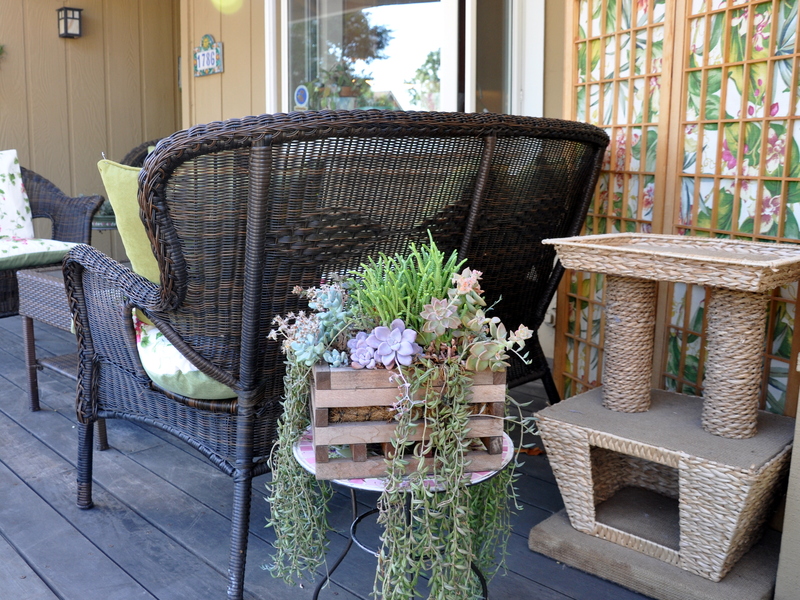 I relocated this broken cat perch (it used to have a third level) from inside the house, and moved the potted succulent from the back garden to the front to fill in the space and add interest. These poufs are a complete afterthought, but one of my favorite additions. 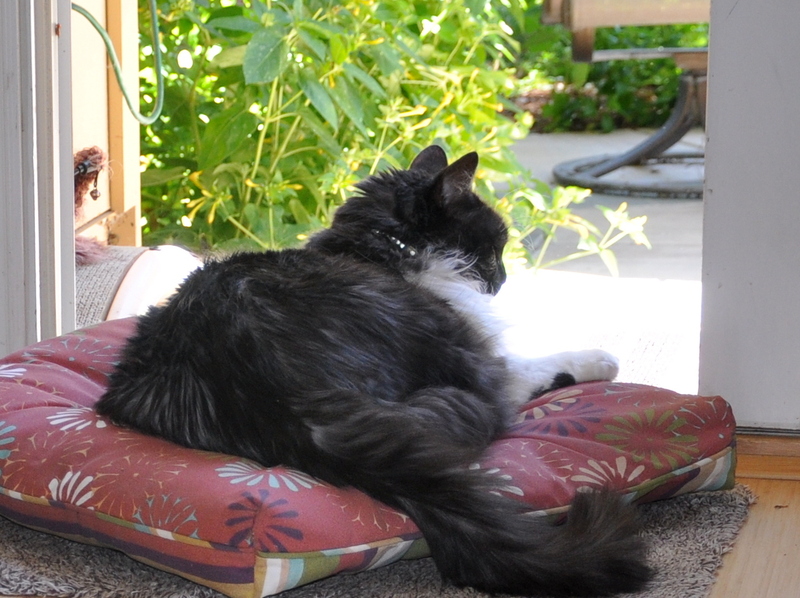 Boomdee has an aqua pouf on her deck. They’re part ottoman and part bean-bag chair. 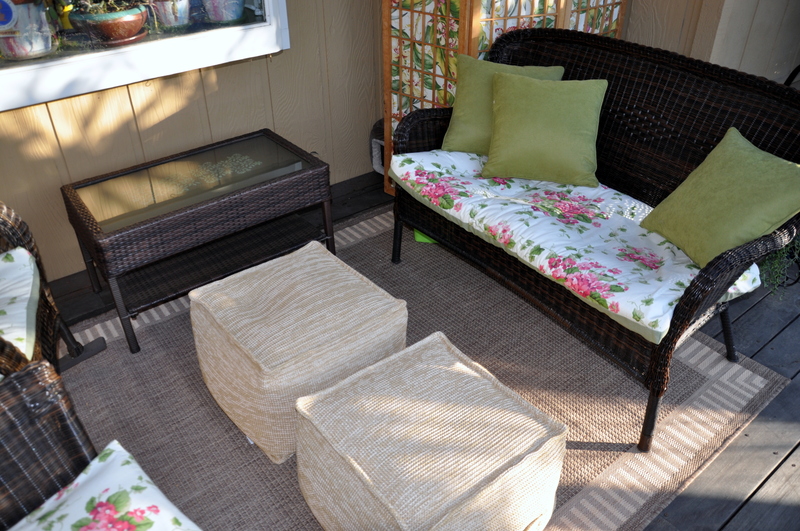 They make an easy-to-move foot rest, impromptu seating and a place to put your tray. I bought the last two at Target as they are clearing out everything for the back to school shoppers. I sat with Mike on the deck this weekend, reading and chatting and enjoying the comfortable space. It feels good to have it pulled together once again. Special thanks to Serena for inspiring us all. Have a look at Serena’s Before and After post at Thrift Diving. I’m a fool for home redecorating and makeovers. For as long as I can remember I’ve enjoyed the “before and after” transformations offered up in magazines, home design shows and even in my neighborhood. Then I joined the blogging world and found an even bigger neighborhood. Oh my goodness. I’m having so much fun. What’s even more inspiring is seeing transformations unfold from do-it-yourself bloggers. 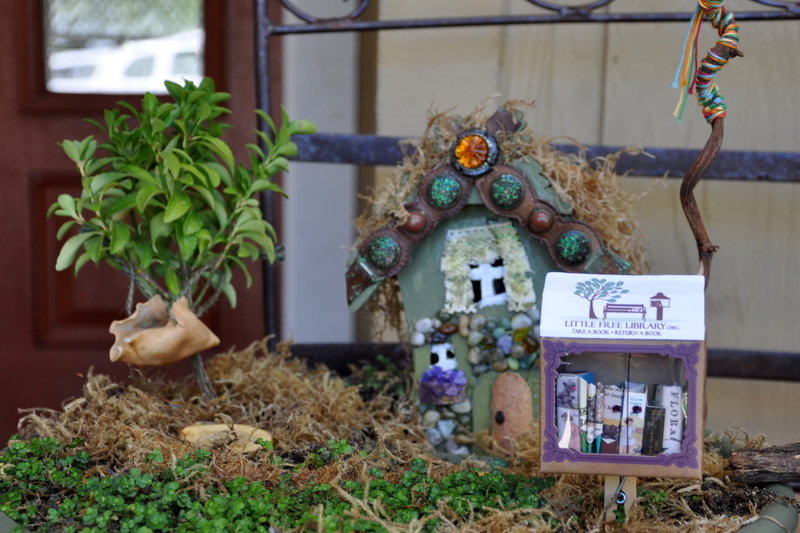 In most cases they have a small budget, big ideas and a can-do attitude. I discovered Serena’s blog through Leilani’s blog via Boomdee’s blog and so it goes around here. It’s like a never-ending game of telephone where someone whispers in your ear, then you turn and whisper in someone else’s ear, and before you know it you’re trying to keep up with dozens of amazing bloggers. Serena and Leilani inspired me to dip my toe into a ten-day room challenge of my own. The goal: Turn my son’s teen room into a guest room by the end of September. 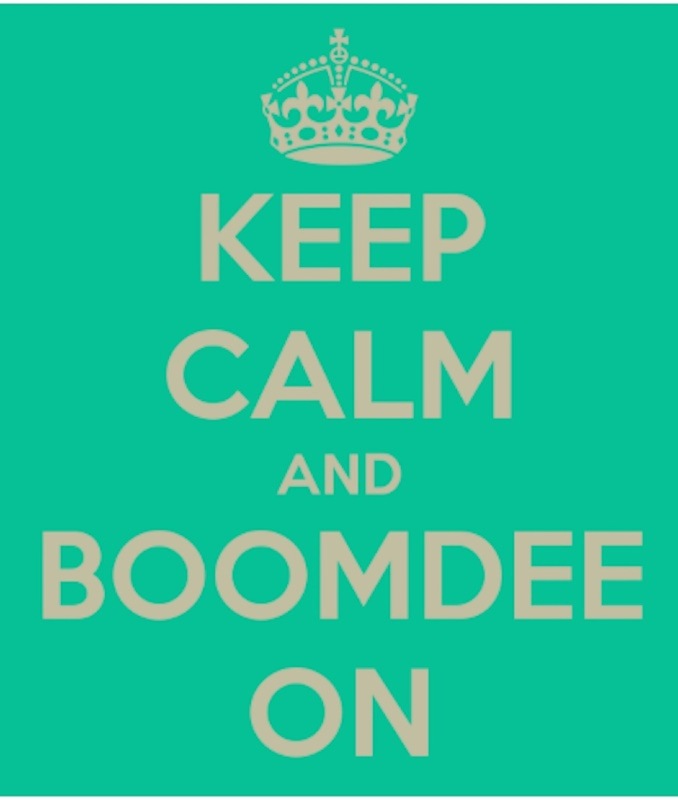 The motivation: Boomdee’s coming to town. The challenge: One cranky left foot (you can read about that here) and my busy life. 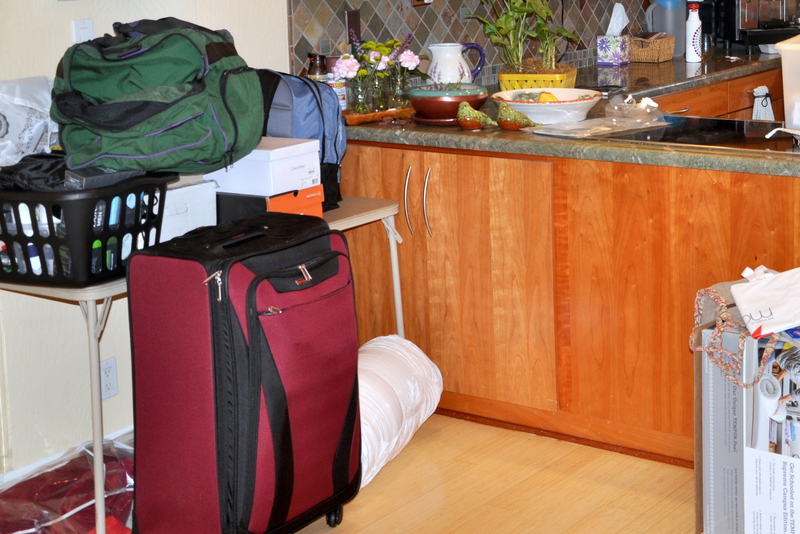 The catch: Since my son’s move to the dorms is seasonal, I assured him that any changes would be temporary. With that in mind, I’ve left the three main pieces of furniture in place. I can easily remove the decorative items and bring the room back to neutral. I’ve been teary off and on since my son moved out. Spending time in his room is helping me connect to his youth, honoring it and letting go. I discovered forgotten treasures including photos, snippets of writing and a box of smashed pennies from family vacations. Lindy’s been keeping me company. I’m sure she’s wondering where he went. First up, the big clean. Moving out is messy business. New items arrived for weeks, destined for the dorms: by mail a heavy box of textbooks and an extra-long mattress pad specific to dormitory beds. We picked up a desk lamp, laundry supplies, school supplies and extra socks for those busy weeks when he can’t do laundry. Here it is, piled up on moving day. It looks like cleaning my kitchen counter was a low priority that day. My college-bound son left a pile of things he no longer wants, so I’ve been having fun passing them on through my Buy Nothing Cambrian group. One happy six-year-old is now the proud owner of a Star Wars wallet. I love that. I sorted, cleaned and recycled my way through the room. Mike flipped the mattress so I could vacuum the bed frame which also needed a quick repair. 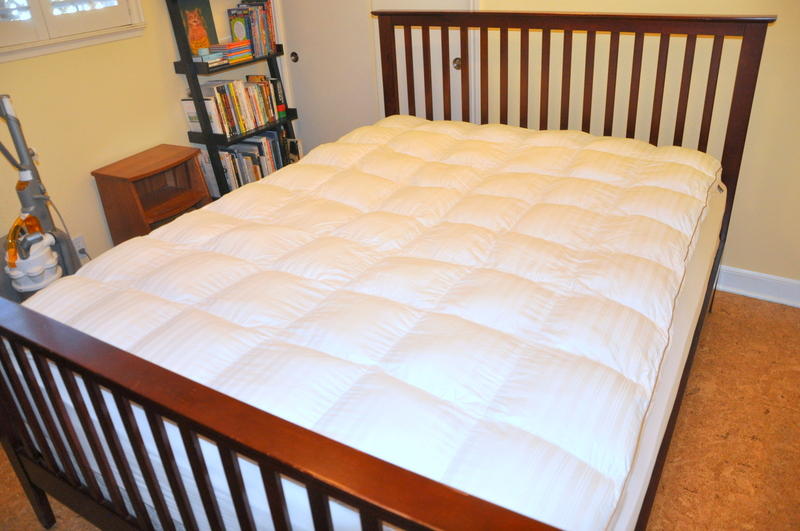 Once it was all back together, I added a mattress topper and covered the bed with our king-sized duvet cover. The duvet cover has all the colors I wanted to feature in the room, and it’s large enough to act as a bed spread for the queen-sized bed. I found a turquoise pillow at an import shop on end-of-summer clearance. It’s the perfect color to pull together the blanket and spread. My son is a minimalist, so his walls were spare; he had a piece of artwork from middle school and a poster passed on from a friend. 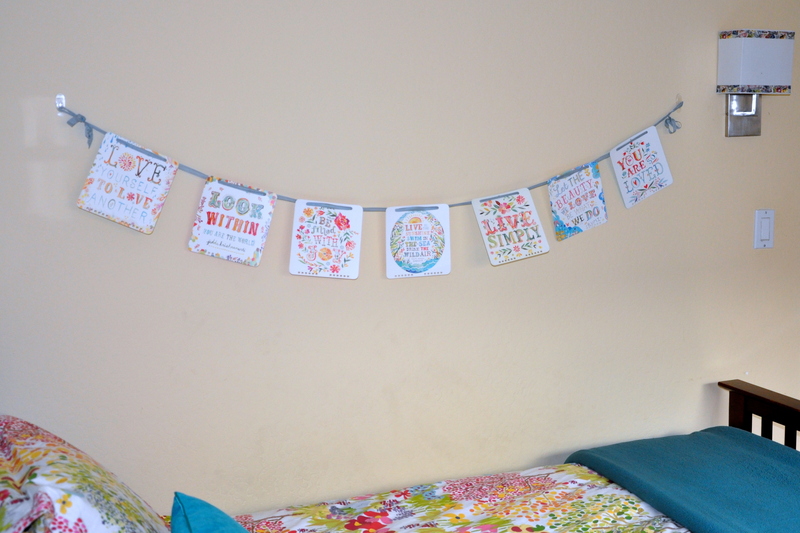 I rolled them up, put them in the closet and pondered ideas for quick and affordable decor. Somehow it all fell in place. Serendipity! I decorated all three walls for about forty dollars. The packet of decals came from our local Target. They were originally destined for the long wall next to the bed, but it wasn’t large enough to fill the space. Instead Mike carefully laid it out on the wall above the desk. This is wear the bum foot became a drag. I really wanted to put up that decal, but instead sat back and [impatiently] watched while he expertly put it on the wall. It looks shiny in the photo, but in person it looks great. 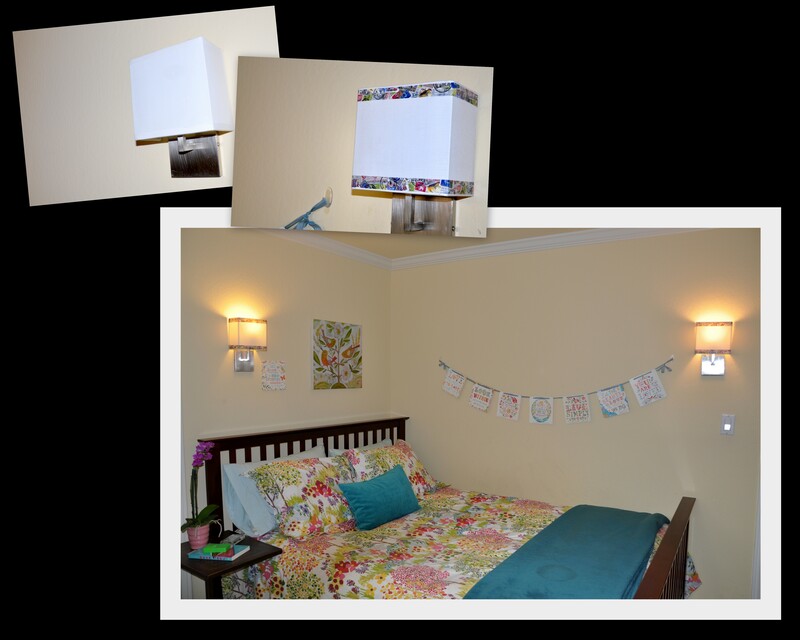 The bird print above the bed and to the right of the lamp was a happy find. While waiting out my phone repair appointment, I wandered into a little shop called Azuca. There it was: a lightweight, wood panel with this charming print and the quote We are birds of a feather. Before I fully realized it, the room was taking shape. It has a sense of travel and flight, with birds figuring prominently. The colors complement my premier guest, the delightful and sophisticated Edmonton blogger nicknamed Boomdee. 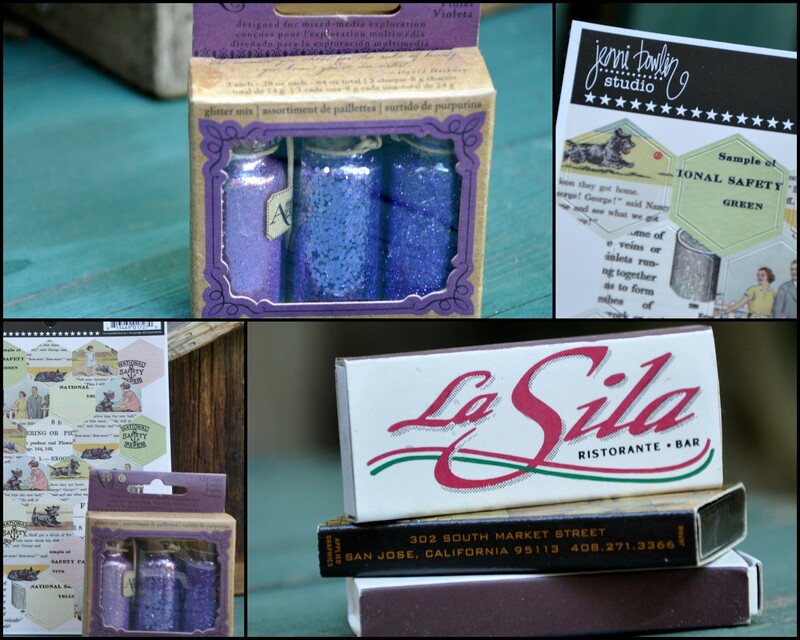 Little did she know that so many of her gifts would later help decorate a future guest room. Wait till you see all the treasures! Which brings me to the third wall. 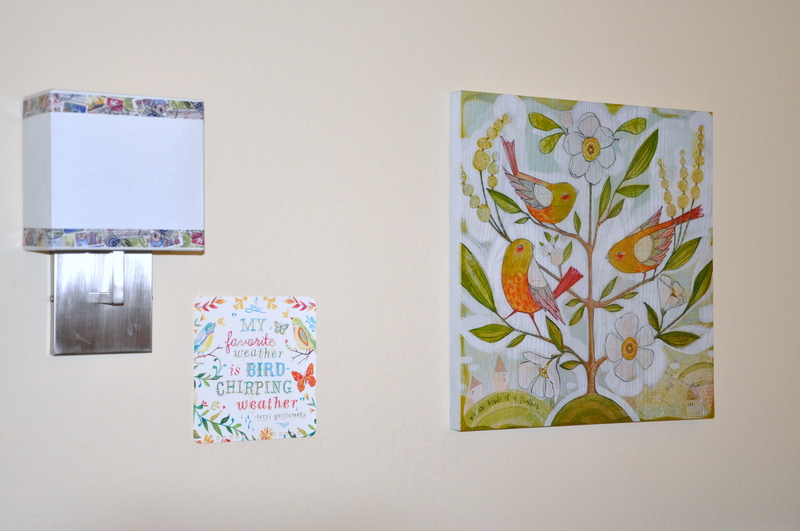 I’ve been saving my gorgeous 2014 wall calendar, featuring the artwork of Katie Daisy. I love turning calendars into new treasures. After removing the coils with a pair of tin snips, I punched holes in the top of the pages and threaded them with vintage seam binding. 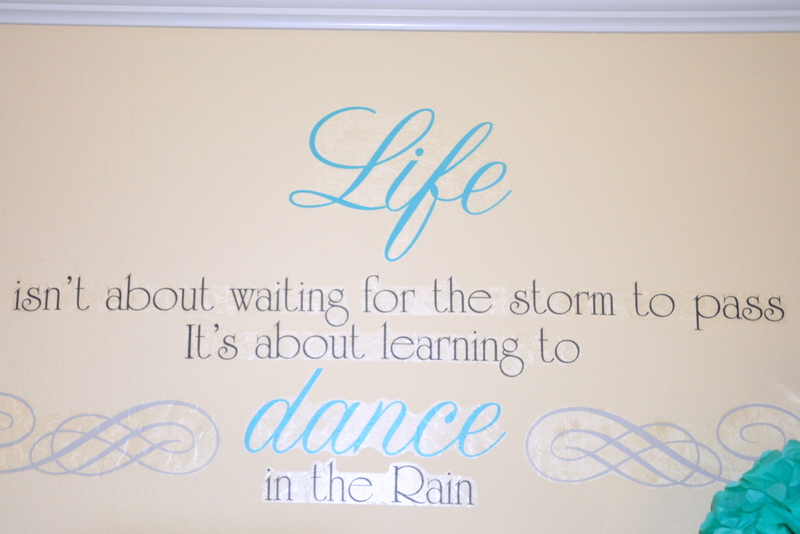 The colors work beautifully in the room and each saying warms and uplifts. I used one of the pages as a compliment to the bird panel. Please stop by tomorrow for the “reveal.” Gosh that’s fun to say. I’m tracking my various nesting materials in the garden, but no discernible visitors just yet. At first I was hoping to spot a bird swooping by. 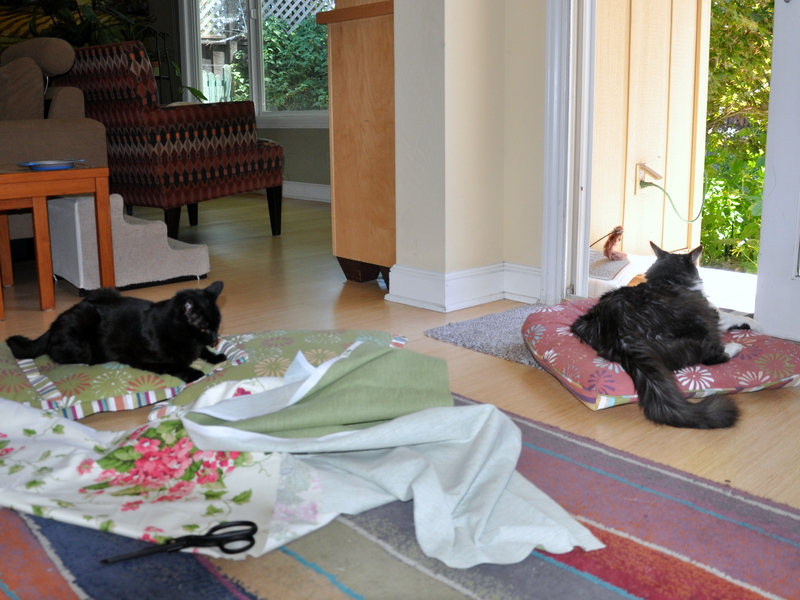 Now I’d be happy with any sign that they’ve found the super-soft bits of wool, laundry lint and yarn. I hung the wreath in the Magnolia tree outside my home office window. The bag of laundry lint is hanging from the Pittosporum out back. I even added a third, large plastic bag, weighted down with a garden table for the squirrels. It’s directly in their path. No takers. After our last big storm I found remnants of what may have been a nest from last year under the pine tree. The bits of blue lint were unmistakably the color of our flannel sheets. So…I remain hopeful. On the subject of birds, I signed up for tweets (I crack myself up) about Phoebe the Allen Hummingbird. I learned today that she’s already laid the first egg of her next brood. These hummers generally lay a pair at a time, the size of tiny breath mints. Here is the link to the live webcam in case you missed it. Warning: watching the nest all day is habit-forming. That said, it’s a habit worth forming. Enjoy!